All invertebrates require food at some stage of their life cycle and bees, butterflies, bumblebees and hoverflies as well as many other insect species use nectar and pollen as a food source. A nectar border in the garden is a way of encouraging wildlife in a quite unobtrusive way, as by choosing the plants that insects like, you can encourage them to visit the garden, without including habitats such as meadows. This may be particularly valuable in a smaller garden, or one where a more conventional look is required. It is possible to create a cottage garden feel, where every plant is a good nectar or pollen source. 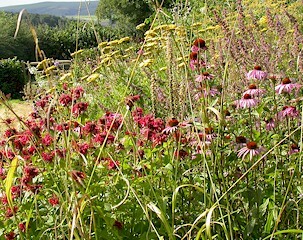 You can also include in this sort of border, plants with seeds to encourage birds. Insects will also bring in birds such as warblers, robins, wrens and spotted flycatchers, as well as hedgehogs and other small mammals. Many plants have supplies of nectar, but they are not always accessible. Many good nectar plants are old fashioned cottage garden types and sometimes the best way to find them is in the garden of a friend or neighbour. Garden centres tend to concentrate on the latest introductions, with bigger and more showy flowers, and these are just the kinds of plants that have little or no nectar. How and where to plant a nectar border Insects detect their nectar sources by colour and by scent. It therefore makes sense to have your plant varieties in large groups if possible. A group of three or five plants of the same type is more likely to be noticed by passing insects than the odd plant of one type. It is also important to choose plants that have single, not double flowers. Planting a nectar border in full sun will ensure that the maximum number of insects find it, as butterflies and bees particularly, like warm sunny conditions. The majority of good nectar plants are hardy. The only other consideration is to try to plant things that flower from the very early spring, right through until the first frosts. Butterflies especially will benefit from nectar from February to October. How to structure your border A nectar border can be made in many different ways, but the most common type is a mixed border with some shrubs at the back, herbaceous plants and herbs in front, maybe some nectar and pollen rich annuals in the spaces and one or two wildflowers as well. Bulbs can also be included to bring colour in the spring. If you prefer, it is possible to make a nectar border entirely with well chosen flowering shrubs, mulched with bark - this is a very low maintenance way of encouraging insects. In smaller gardens you may want to make a small border of annual plants, varying the types each year, and this can be very effective indeed. Basically a border can be designed to be what ever you require - the only important consideration is the choice of plants. Choosing the right plants Most wildlife gardening books have lists of good nectar plants, but beware! Much information is recycled from one book to another and sometimes the suggestions are incorrect. One of the best ways of choosing plants is to use your own eyes when you are visiting friends or large gardens open to the public, and make a note of anything you see that seems to be attracting insects. Even a visit to the garden centre can provide useful information, (providing you go when plants are in flower.) It is also worth remembering that nectar production is dependant on the time of year, the weather, and even type of soil. A plant that may be brilliant in a garden you visit may not be that great with you. There is an element of trial and error. However, having said that, here are a few suggestions of plants that will definitely bring the butterflies, bees and birds to your border. Plants for butterflies Most of us want to see more butterflies in the garden and there are many good plants that will attract them. For the back of the border try the paler forms of Buddleia. For the mid-border there are a good number of smaller shrubs and herbaceous perennials which will fill the spaces and provide colour over a long period. Many of our most useful herbs are good butterfly plants, particularly hyssop, lavender and marjoram. These, planted with sweet rocket (dames violet), honesty, michaelmas daisies, coneflower (Echinacea), scabious and some annuals such as cornflower will provide masses of summer colour, going into autumn when the michaelmas daises come into their own. The front of border plants could include bugle, sedum (ice plant, and the true species is the only one worth planting), and phuopsis. Plants for bees Honey bees, bumble bees, leaf cutter bees, carder bees - there are many different species of bee that visit the average garden. Lots of plants will provide them with pollen and nectar but a few of the best are listed here. For bumblebees the Buddleia globosa is very good for the back of the border (this will not attract butterflies). Some of the small shrubby herbs mentioned in the butterfly section are also good, particularly hyssop, rosemary and lavender. Plants like catmint, Echinops, yellow knapweed, Echium and dead nettle are all excellent. Plants for hoverflies Hoverflies are very useful in the garden because they and their larvae eat aphids, so encouraging them is good biological control of these pests. Many of the small open flowered annuals are good for them, especially poached egg plant, baby blue eyes, Californian poppy and shirley poppy. Plants for birds Birds are quite fussy about the seeds they like but there are a few plants that can be guaranteed to bring the finches in particular to the garden. Try cornflowers, including the coloured varieties, evening primrose, hardy geranium, teasel, and forget me not.